5 Costly Pitfalls of Managing Your Operations with Spreadsheets - MT Works, LLC. It is easy to understand why spreadsheet applications like Microsoft Excel are the “go to” software tool for managing a company’s daily operations. After all, with a little technical knowledge, employees can set up spreadsheets to handle just about everything, including project planning and management, inventory control, asset tracking, and quality assurance. Very Low Learning Curve – Unlike traditional ERP systems, spreadsheets are easy to use and employees can quickly learn the basics. Inexpensive and Readily Available – Microsoft Office is the industry standard. Excel is pre-installed on almost every business computer so there is no need to purchase any additional software. Up and Running – With spreadsheets you can get up and running very quickly with little lead-time. Easy to Modify – Managers can modify their spreadsheet templates on the fly to accommodate changes in their process without requiring outside assistance. The idea that spreadsheets are easy to use is to some extent a fallacy. While it is very easy to get an answer from a spreadsheet, it is not necessarily easy to get the correct answer. If you have ever been in a meeting where you were confronted with multiple versions of the truth due to everyone having different numbers in their spreadsheets, then you can understand this phenomenon. This happens because spreadsheets are files and not a centralized data source (like a relational database), which makes them difficult to manage. They are emailed around and edited by multiple people—all of which increases the risk that data will be lost or overwritten because team members are not using the most recent version. The more team members involved in the process and the more distributed the environment, the greater the risk becomes. The goal of data reporting is to present the correct answer, not just any answer. Often a wrong answer is more costly than no answer at all. Typos, cut and paste errors, and formula defects can cost your company millions. According to CNBC, financial modeling firms estimate that spreadsheet errors have cost businesses billions of dollars. They state that at least 88% of all spreadsheets have errors, while 50% of spreadsheets used by large corporations have material defects. An article by CIO titled “Eight of the Worst Spreadsheet Blunders” identifies several devastating drawbacks resulting from the problematic use of spreadsheets. Spreadsheets lack a unified reporting mechanism, which means there is no efficient way to quickly report the data contained across multiple files. For example, let’s say an organization is using spreadsheets to forecast their asset utilization across multiple locations for the next six months. If each location is using one or more of their own spreadsheets to accomplish this, managers are unable to instantly get a clear picture of the total forecasted utilization across the whole organization. Instead, team members must manually compile any needed reports from all the various spreadsheets, which can be extremely time intensive, as well as error prone. Time spent maintaining spreadsheets creates a real opportunity cost. When an organization commits to using spreadsheets to manually handle their operational activities, they are dedicating hours that could be used to a greater benefit elsewhere. While the initial creation of spreadsheet templates may be easy enough, as your business processes evolve, the templates must be modified to keep up. Columns and rows will be added or modified, formulas changed, and entirely new spreadsheets may be added over time, which creates a growing mishmash that becomes more and more time consuming to manage and maintain. Security features for most spreadsheets are minimal at best, allowing any user with access to the file the ability to modify it. In many organizations access to the spreadsheet documents is often not limited exclusively to the team members that are required to view and edit the file. Even when security is tightly controlled, it is extremely difficult to establish a clear audit trail and identify who made what changes to the data, and when. This can be a big challenge for organizations that routinely undergo external process audits—such as ISO or EPA. Spreadsheets are not inherently evil and are, in fact, a wonderful tool for what they are meant to do, such as crunching numbers, creating charts and graphs, and analyzing data derived from your organization’s existing centralized management database. However, problems arise when spreadsheets are pushed far beyond their intended function. 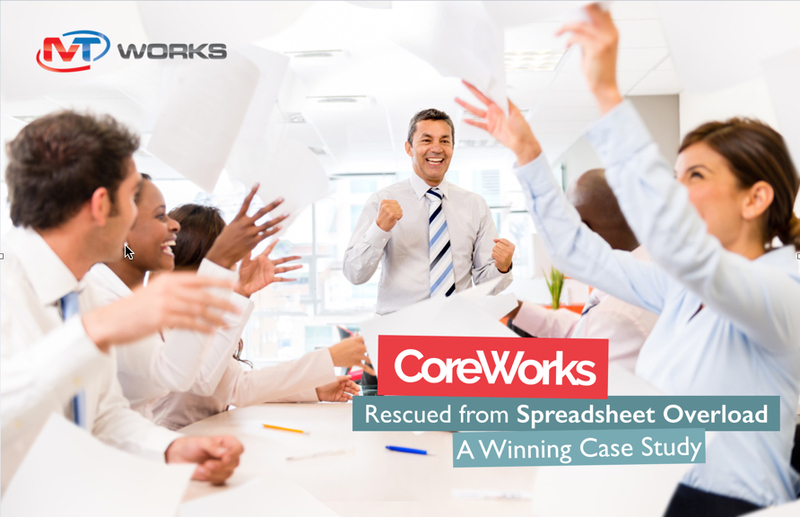 Many organizations rationalize the use of spreadsheets as an alternative to a relational database software solution. Spreadsheets should never be viewed as the “system of record” for your key operational data. Please contact us today if you are interested in learning how you can minimized your dependence on spreadsheets for managing your organization’s daily operations.